Use our mountain bike size guide to find the perfect frame size for you. Choose the right size MTB and your bike will handle better and give you a more comfortable, efficient ride. Which size mountain bike do I need? Remember, all sizing information is a guide only. If you have any questions about bike sizing, our expert team is here to help. Call us on 0330 555 0080, use our Live Chat, or email us. With your shoes off, stand upright against a wall, with your shoulders back and legs together. Use a pencil to make a small mark on the wall above your head – make sure you hold the pencil parallel to the floor. Then measure from the floor to your mark, in centimetres or feet and inches. With your shoes off, stand upright with your back against a wall. Place a book/ruler between your legs, level with your crotch. Then measure from the floor to the top of the book/ruler, in centimetres or feet and inches (it’s easier if a friend helps). How are mountain bikes sized? Mountain bikes are usually sized in inches, or using a S/M/L system. An MTB’s frame size is traditionally calculated by measuring the length of the seat tube, from the centre of the front chainring to the top of the tube (where the seat post inserts). MTB frame design varies quite considerably across models and styles, so to keep sizing consistent, manufacturers sometimes use a ‘virtual’ seat tube measurement. NB. Sizes can vary slightly between manufacturers. I’m between sizes – which mountain bike size should I choose? If your measurements suggest that two mountain bike sizes are suitable, then in the end it’s a personal choice, but most riders will choose the larger size. A mountain bike with a slightly larger frame is easier to handle than one that feels cramped. You can always fit a shorter stem if necessary, to reduce the reach to the handlebars. Fitting a longer stem, on the other hand, may adversely affect the bike’s handling. Which MTB wheel size is best for me? The oldest, most recognisable size of MTB wheel, they are now quite rare on new bikes. Although very manoeuvrable, they struggle to carry speed on rough ground. Most modern bikes with 26-inch wheels will be made for smaller frame sizes or freestyle riding. For the most part, you will only really see teenage bikes with 26" wheels. 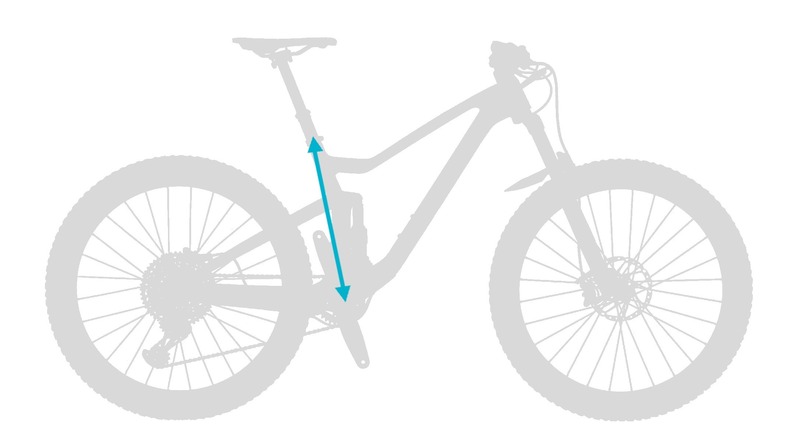 The most common size on all MTBs, as they provide the perfect balance between cornering and rollover speed. They can be used for a very wide range of riding styles and therefore suit a majority of riders’ needs. Plus-size wheels are fitted with 2.8” or 3.0” width tyres, on a 27.5” rim. This combination gives them a similar overall diameter to 29” wheels, and they can often be fitted to 29er MTBs with BOOST axle spacing on the fork and back wheel. Though they’re a little slower to accelerate, 27.5”+ wheels give better grip and cushioning and are ideal for hardtails. You’ll also find them on electric MTBs. The least nimble, but fastest-rolling platform possible. Small riders may find these difficult to control, but experienced mountain bikers love these for racing and conquering rough ground at speed. 29ers are especially popular with enduro, downhill and cross-country riders. Are frame sizes different for women-specific mountain bikes? Yes – for example, a Medium women’s MTB will be smaller than a Medium men’s MTB. However, the sizing itself is calculated in the same way, so a 17” men’s and women’s bike have the same frame size. NB. Some manufacturers also change other aspects of frame geometry on a women-specific bike, to offer women a better fit. For example, women tend to have shorter upper bodies than men, so women’s bikes can have shorter top tubes (the sloping tube running between the handlebars and the saddle), to reduce the reach to the handlebars. If you have any questions about bike sizing, our expert team is here to help. Call us on 0330 555 0080, use our Live Chat, or email us.